For proper fit, NetEquestrian recommends that you take the time to determine your measurements before you order. Have another person measure your leg for the most accuracy. Properly fitted tall boots will, at first, be uncomfortably tight around the top of the boot and should come up into the back of your knee. They should be difficult to pull on and off or zip up. As they break in, they will drop comfortably around your leg. Half chaps should fit similarly to tall boots and should also come up into the back of your knee at first. When fitted properly, they will be difficult to zip at first, should be uncomfortably tight around the top, and will drop comfortably around your leg as they break in. When referring to half chap sizing charts, it is important to keep in mind that all half chaps are measured at the widest part of the calf, but each brand measures height differently. Specific size charts can be found on individual product web pages. Wear the clothing (breeches, tights, socks, etc.) you are most likley to wear with your boots. Sit in a straight chair with feet flat on the floor and knees at a 90 degree angle. Measure calf around the widest part, and measure height from the floor to back of the knee. Add 1 1/2" - 2" to measured height to allow for drop as your boots break in. 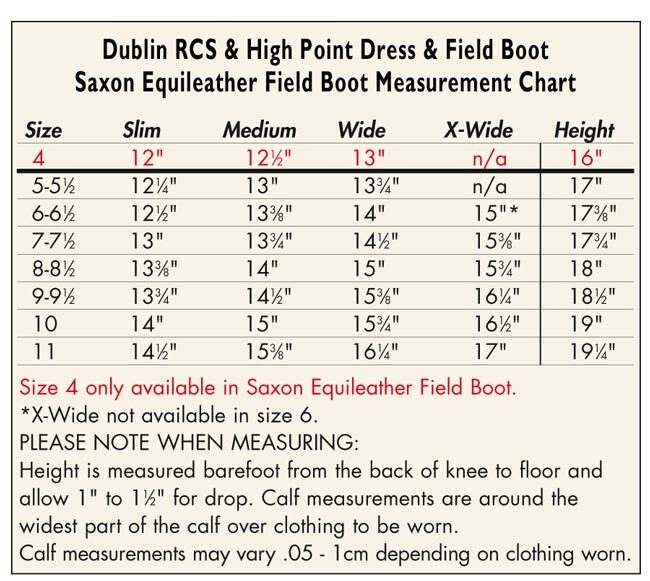 The Ariat sizing chart is located below. Additionally, click the "Print Chart" button to view a PDF containing a printable document that can be used to assist in determining your shoe size.